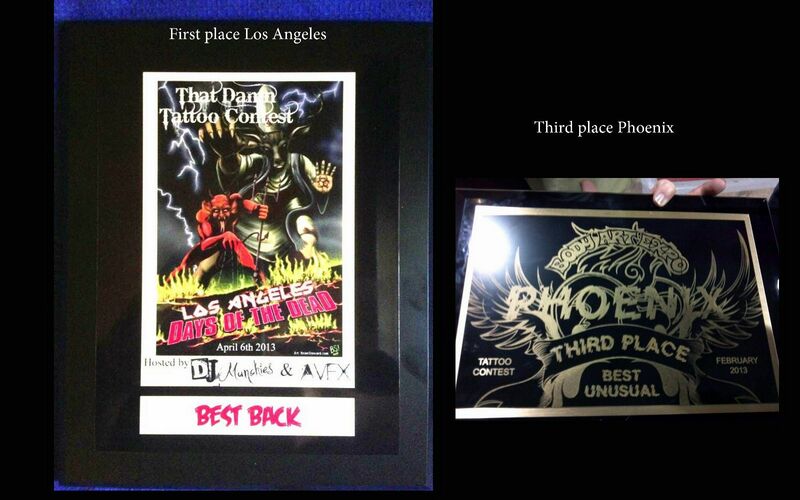 Haley Adams: I just recieved 1st place in the back piece category in Los Angele's at the Days of the Dead convention!!! The award is for the Chucky killing toy story back piece i did, which also took home a 3rd place award in Phoenix in Feb. Before the LA convention we finished off the sides of the back piece (which we ran short on time to do before the Phoenix convention) i will put up more pics of the finished product soon. The LA convention's back piece category had over 20 other back peices entered, and the Phoenix convention had 28 in my category. These two conventions are my first tattoo contests i have ever entered so im very excited ;) Thank you for all of your support! !